Here's something magic that you can do with just a few spices from your drawer. It's a combination of flavors that don't make their way into dishes too often in this combination - but the end result is hardly unusual or overly powerful. It's just.....well, delicious. I've served this crust on tuna to young kids as well as adults with sophisticated palates. It works for everyone. If you want to go a step further, blend garlic, lemon, chives and some salt and pepper into mayonnaise to serve atop or next to the tuna. And an even further step is to make the mayo from scratch....but that's a story for another day. Toast fennel, coriander and pepper over medium heat, about 3 minutes. Grind spices and add salt. Coat tuna with olive oil. Sprinkle with spice mixture, press down. Sear tuna until. Rare center is about 2 minutes per side. Optional: refrigerate 1 hour, then cut into slices. Whisk all ingredients in small bowl. refrigerate for at least an hour. What Herbs and Spices Should You Have? Thyme – a workhorse across many cuisines. Very easy to grow. Basil – summer herb, can be grown indoors in pots. 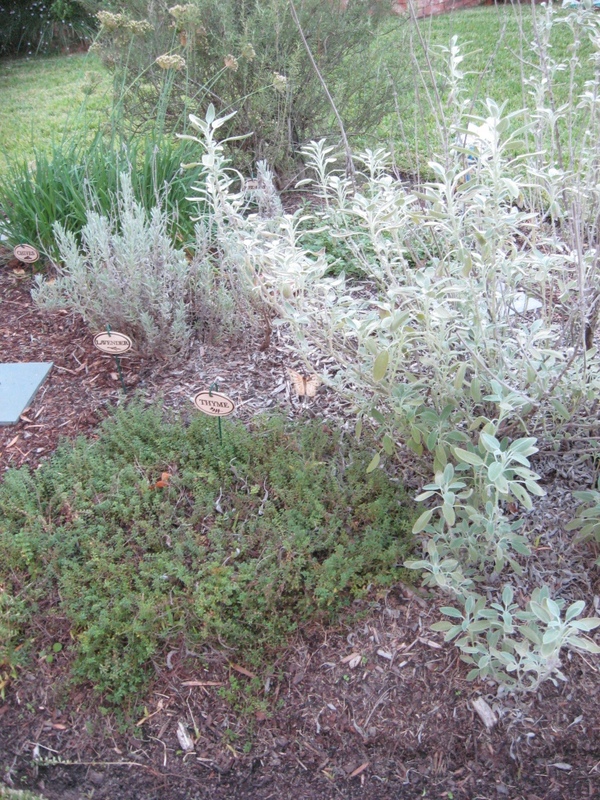 Rosemary – strong contributor to many cuisines. Very easy to grow. Bay Leaf – a small tree, more powerful fresh. Can be potted to retard size. Chives – a wonderful, gentle taste. Purple chive flowers are edible. Mint – grows like a week. Many varieties with differing taste. Oregano – least appreciated fresh herb. Unique. Easy to grow. Sage – grows easily, beautiful purple flowers in spring. Several varieties. Tarragon – tender, difficult to grow, but worth it. Awesome fresh herb. The list below is in priority order based on importance to good and interesting cooking. Ground Cumin – it's surprising how versatile a little cumin is. Chinese 5-Spice Powder – Unique blend, store-bought is OK. Homemade better. Saffron – most expensive spice in the world. No flavor substitute. Onion Powder – use an onion. PLEASE. Garlic Powder – use real garlic. PLEASE. Dried Parsley – use fresh, or skip it. Instant Coffee (Italian) – occasionally used for tortes, flourless cakes, etc. I had lunch with my friend Katy last week. She told me she spent the whole summer focusing on cooking. At one point she asked a chef friend for advice about what to have on hand in the kitchen, but didn't get useful advice in return. We'll start with spices and dried herbs, then in future weeks cover pantry and vegetable staples. I've broken down fresh herbs, spices and dried herbs into groups based on how often you'd likely use them - at least related to the cooking advice and recipes you get from me. But don't forget. the only shortcut to becoming a great home chef is to use fresh herbs. Here's my article about fresh herbs, The Only Shortcut to Becoming a Great Home Cook, if you want to review that advice. But, we do have off seasons, don't always have indoor potted versions, sometimes a plant dies or is devoured by caterpillars (parsley) and we need to rely on dried versions. Spices and seeds - well, they're mostly in dried form anyway, so they're the main subject of this discussion. I try my hardest to NOT buy the major brands of dried herbs and spices such as McCormick's or Spice Island. The are often on grocery and warehouse shelves for years. Notice the pale colors. Notice how many look like crumbled sticks and twigs instead of dried leaves. No thanks. Bulk spice purveyors - some towns have a gourmet shop or even a dedicated spice shop.These are great sources if you have them. Many grocers now have bulk spices. They're a great value, and usually, but not always, as good or better than pre-packaged spices. You need to test and taste bulk spices, compare them to prepackaged and make your own decision which is best. There's a lot of variation. But bulk is often the best bet for quality and price. Mail order - Penzey's out of Madison, Wisconsin has an enormous selection of high quality spices for sale online and through catalogs. They're good, but I don't tend to shop for a whole bunch of spices at one time, so I don't turn to them often. I wish I used more of their products though. They are good. Do not leave jars of spices and herbs in a kitchen with direct sunlight. The sun will accelerate the loss of taste and color of the herbs/spices. Store them in a pantry or kitchen drawer. Here's how it worked out for me. I graduated from spice rack (college) to spice hanging basket (lame 1980's decor) to spice shelf which gave way to the full on spice drawer. 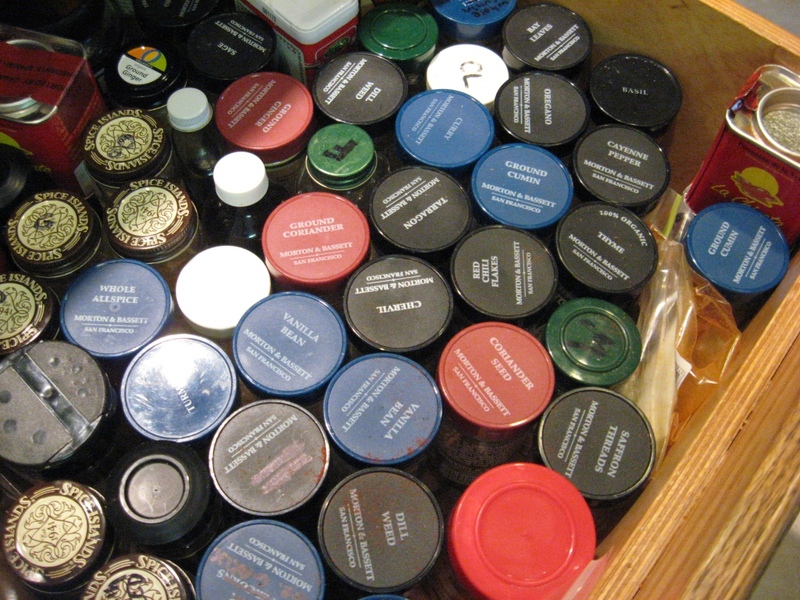 Maybe the spice drawer came about because Morton and Bassett labels the top of their bottles. I also have an unnatural phobia of lazy Susan turntables, where kitchen spices are often stored. In the next post, I'll provide my recommendations for your spice drawer / rack / shelf. But not your hanging basket. That was a bad idea even in the '80's. Next week I'll run through pantry staples and standard vegetables to have on hand at all times. You might also want to review my prior recommendations of Kitchen Tools You Can't Live Without. A little backwards this week. Here's a recipe. Commentary / advice / rambling thoughts to follow. You need to make this dish. I've been on a Jamie Oliver tear for the past few weeks, with good reason. Yesterday I saw a recipe that called for coring medium sized potatoes, then stuffing them with bacon, an anchovy, a sage leaf and lemon zest. Stunning presentation, but all I had were fingerlings - too small to stuff. So I halved the fingerlings and used similar ingredients, mixing a little anchovy paste with lemon juice. Roast for 25 minutes. Unbelievable. You can't stop eating these. Fingerlings are a nice, but expensive, shortcut in the kitchen. They usually just need a gentle rinse and never need peeling. So preparatiaon is super fast. The trick is if you can find fingerlings at a great price. Spec's flagship store in mid-town Houston has them for about $1.50 per pound. 1 teaspoon anchovy paste, or 1 anchovy mushed up with a fork. Rinse the potatoes, and slice all by the smallest ones in half lengthwise. 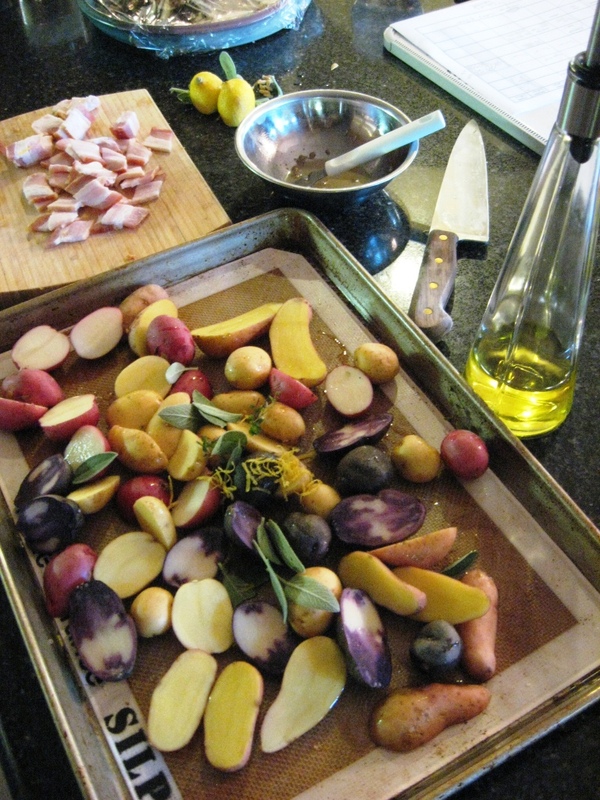 Toss potatoes with lemon zest, oil, bacon pieces, lemon juice mixture, sage and thyme. Roast for 12 minutes - check doneness, and roast for 8-12 more minutes. Turn pan if your oven heats unevenly. Serve immediately or at room temp. Thyme on bottom left, sage on right. Third go-round in a week with Chicken Caesar. This time used non-romaine. Doesn't matter. This is incredible. I'm not quite sure how the word 'proper' slipped into the title Jamie Oliver gave this salad, excepting that the word itself is a common Britishism. I'm going to step on the toes of his so-called proper salad by showing you a picture that clearly has arugula, radicchio and endive in addition to romaine. So there. I'm quite excited to share this recipe and technique. Last week I got copy of Oliver's book Jamie at Home , and have actually made this caesar salad three times since. Granted, I had a lot of croutons and caesar dressing left over after making a double batch for the homecoming dinner. But it was so good we kept making it every other day. There's a technique offered in this recipe that I've never run across. Toss rustic bread cubes in olive oil and rosemary, then place chicken legs atop the bread cubes. Actually, toss the chicken with the oil and rosemary first, then place them atop. As the chicken roasts for an hour, the drippings will infuse the croutons as they crisp up. 45 minutes into cooking, lay strips of pancetta or bacon over the chicken, and let that crisp up and also drip into the croutons. Have I said enough? You want to make this right now, don't you? 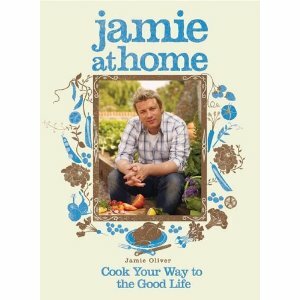 I've read several recipes from Jamie At Home, and seen eipsode of the TV show, and they frequently make me want to stop what I'm doing and cook that dish. He's got quite a palate and a great imagination for simple but innovative technique - as proven above. I'm not going to give the detailed recipe for this dish here. The cookbook is newly published, and I encourage you to buy it. On the other hand, you barely need a recipe - especially for the crouton, chicken, rosemary part of the dish. The dressing, well, the proportions would benefit from reading Jamie's book. There's a link below so you can order a copy from amazon. Toss chicken and bread in olive oil and add fresh rosemary leaves. Bake for an hour at 400 degrees. Shred chicken off the bone after it cools enough to handle. Caesar dressing: anchovies, a small amount of garlic, a liberal amount of high quality parmesan cheese, a good couple squeezes of lemon juice, olive oil in triple the amount of lemon juice. Stir together and season with fresh black pepper. A couple hearts of romaine lettuce (or other mix if you prefer). Toss all ingredients together. I recommend very lightly dressing the salad to let the other flavors, tastes and textures shine. Remember the Naked Chef? He Grew Up. There was a show on some years ago called The Naked Chef, featuring Jamie Oliver. At the time he was a 20-something, high energy, flash in the pan, or so I thought. The title, the opening scenes where he zipped around on a little moped/scooter/thing, the frenzied British banter, it all did nothing to connect with me. I may have look at an episode or two, but even if the cooking was good, I just didn't want to like this guy. Guess what? Jamie is grown up now with a cozy house in the country where he makes family meals for his wife and kids. He's committed to home gardening, taking it almost to a commerical scale. The frenzied energy is still there, but it's focused directly on the kind of cooking I keep preaching about: fresh ingredients and fundamental techniques. OK - his imagination and flavor combinations are so far beyond my creativity that I'm embarrassed. But this is also why I encourage people to rely on a small library of excellent recipe sources, rather than continually wandering the world of improvisation with average results. In his latest book, Medium Raw, Anthony Bourdain of Kitchen Confidential and No Reservations fame, one of the most influential food celebrities, puts Oliver on his short list of cooking talents he respects. Funny, now Jamie Oliver is like Gordon Ramsey to me. I saw him, wrote him off, only to later learn that the TV exposure, the restaurants and publication empire was based on a foundation of truly excellent cooking and innovation. I first saw a couple episodes of his current show, Jamie At Home on the cooking channel. The first two I saw had such delicious looking recipes that wrote them out by hand from the TV episode. I made a couple of them right away. A few weeks later I ran into a companion book for the series. Rather than give any "lessons" or advice this week, I'm just encouraging you to watch his show or buy his book. Besides many, many great recipes for any level of cook, it's beautiful in photographic and graphic design terms. The book also has extensive text on growing and harvesting a range of vegetables at home, including rhubarb, cabbages, carrots, lettuces, actually, more than I can reasonably list here. In the next post, I'll share the concept of one his recipes, which I made three times in the first week I had the cookbook, "Proper Chicken Caesar Salad". It uses a simple, but incredibly effective and innovative technique. Some of the other recipes I've made are Kefta Kebabs with Pistachio and Spicy Salad Wrap, Rhubarb Bellini, Warm Strawberries with Pimm's. I plan to make Asparagus Potato Tart, Zucchini Carbonara and Hot and Sour Rhubarb with Crispy Pork and Noodles. Again, you'd be surprised that these recipes have fewer ingredients and less complex techniques than you'd ever imagine, based on the titles. by adding some mixed greens we had on hand instead of just romaine.